The global leader of software transformation solutions. Delphi2CS is an assistant tool that converts Delphi 5,6,7 and Delphi 2010 to C#. 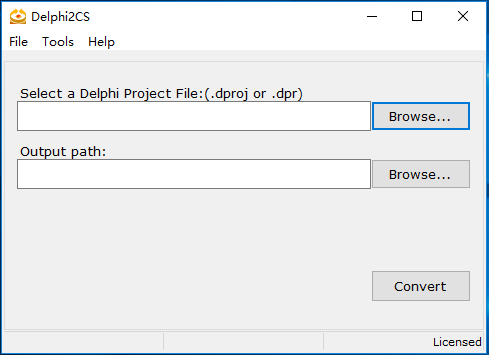 Delphi2CS creates a new project, converts each file from the original project into the new project(.csproj), and generates a report detailing what was done. After your project is converted, Delphi2CS inserts comments into your C# code alerting you to statement that will need to be changed. Converts Paradox DB to MS Access (mdb). Delphi2CS does not guarantee that the generated C# codes work fine, because many of the VCL components and objects do not have the corresponding components in .NET. Feel free to contact support@netcoole.com if you have any questions. Copyright © 2002-2018 Netcoole . All rights reserved.